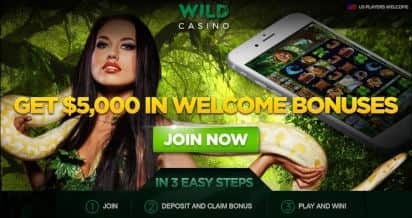 Wild Casino Review 2019 - Get $5000 in Free Bonuses! Caters to players from the U.S.
Visit Wild Casino Get Your Bonuses! Wild Casino uses trusted software providers with certified RNG. Licensed and regulated under the jurisdiction of Panama. Cashier features multiple U.S.-friendly online payment methods. ? All legitimate, real-money online casinos like Wild Casino have strict anti-fraud screens, and that may create a short withdrawal delay. Withdrawals of up to $10,000 processed within 48 hours. New players who sign up can get a total of five deposit bonuses for up to $5,000 for free. Wild Casino bonus codes are required. The standard first deposit bonus is of 100% up to $1,000 for the promo code WILD1. ? Please read the terms and conditions carefully and make sure to take full advantage of the bonus offer. If you are looking for premium online casino games within the United States, you will very likely come across Wild Casino. Although this gaming site is still fairly new, having launched in 2017, it is already on the list of favorites for many players. One of the reasons for its fast rise in popularity is the $5,000 welcome package promised for new customers. You can get five deposit bonuses to double your bankroll and have the freedom to enjoy the games without any worries. On the topic of games, Wild Casino has selected titles from Betsoft and from Nucleus Gaming that can be played for real money straight from the site. One of the great things about the modern platform is that it works perfectly on smartphones and on tablets. Wild Casino Mobile allows players to bet on slots, live games, video poker and other options in perfect security. The site follows a jungle theme while making sure that the interface is easy to browse. Big buttons for the different game categories are available on the main page, along with links to the promotions and the cashier. WildCasino.ag was launched by Commission.biz, which is the same group that operates BetOnline in the US. It is licensed in Panama and has a good reputation that goes back quite a few years. American players can join without hassle and the dedicated banking options make it easy to add and withdraw money to the account. As we will cover later in the Wild Casino review, clients can even use big cryptocurrency wallets to make payments, like Bitcoin, Ethereum and Litecoin. So if you want to play thrilling casino games for real money and not have to go to a casino, the Wild gaming platform can be a perfect solution. Nowadays, it is common to see online casinos combine two or more software providers in order to offer a more diverse selection of casino games. Wild Casino follows the trend by using software from both Betsoft Gaming and Nucleus Gaming. Both of these providers are known for their premium slots and are licensed on an international level. They also use certified RNG for the games so that every outcome is always fair. The difference in style between the two studios can be noticed quickly and there are definitely some iconic titles that stand out straight away. Betsoft is the leading provider when it comes to 3D slots so players at Wild Casino can enjoy impressive graphics that are sure to make for an entertaining session. Both developers are focused more on quality than quantity so the list of gaming options is not as long as you might be able to find at other online casinos. However, every entry in the collection deserves your attention. You can start a game in a matter of seconds since the platform runs on Flash and doesn&apos;t require additional downloads. Play from the internet browser app. You can browse the games on your computer from the site and start playing straight away. Just click on the preferred option and it will open in a secure pop-up window. Take your favorite games with you on your smartphone. 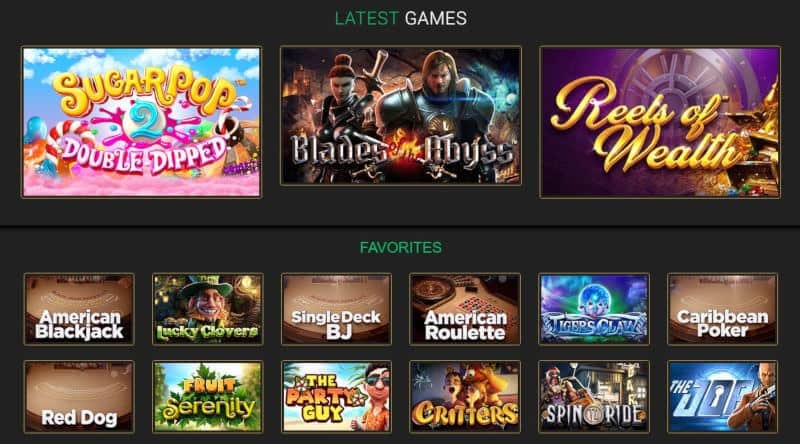 As long as you have a compatible mobile device and connection to the internet, you can go to WildCasino.ag and continue playing at any time. You don&apos;t need to download and install special mobile apps. It is safe to say that mobile gaming is hugely popular and it is important for players to be able to easily access the gaming options at any time. Wild Casino meets this demand with its compatible platform that runs well on iOS and on Android devices. The site changes a bit to fit the screen but it keeps the same overall style and layout. The best part is that most of the games available on the desktop casino can also be played on the go. There are some exceptions but not that many so it is very likely that you will find your preferred titles on the Wild Casino mobile site. If you registered already, you can use the same account to play on any device. If not, you can join from your phone and even make deposits while on the go. The site is always secure and the big bonuses are applied if you use the bonus codes listed in the online review for Wild Casino. The menu button presents the categories for the games, where slots account for most of the collection. It is worth pointing out that you can also play live casino games on your phone, something which is quite rare. The live video makes the whole experience more entertaining. Of course, mobile slots remain the most popular options on the platform and the real money prizes can really go up in this category. The topic of games is always an important one when it comes to online casinos. It is what basically makes the gaming site and so it is good to have plenty of options so that all players are entertained. However, having too many games can also be an issue since users will have a harder time finding the perfect fit. Plus, for players in the United States, the selection of reliable developers is limited due to local regulations that make some of the studios stay out of the market. In general, it is good to have more than 100 games and they need to cover different categories. Although slots are the most popular, customers like to enjoy variety across table games and other options. Wild Online Casino seems to have everything covered in this regard. The selection has over 130 entries and new titles are added from time to time. And it is not just about slots either. There are plenty of other types of games to check out and they keep the premium quality that Wild Casino clients can quickly get accustomed to. It is also one of the few casinos where American players can enjoy live dealer games, like live roulette and live blackjack. Most players will often head over directly to the slots category when visiting an online casino. These gaming options can be very entertaining since they come in hundreds of themes and styles. The detailed graphics combined with the potential for massive payouts make online slots perfect for different types of players. As we mentioned in the Wild Casino review, the online casino covers the slots category well and offers around 90 different options. Most of them are modern 5-reel slots but you can also find a few classic 3-reels as part of the list. 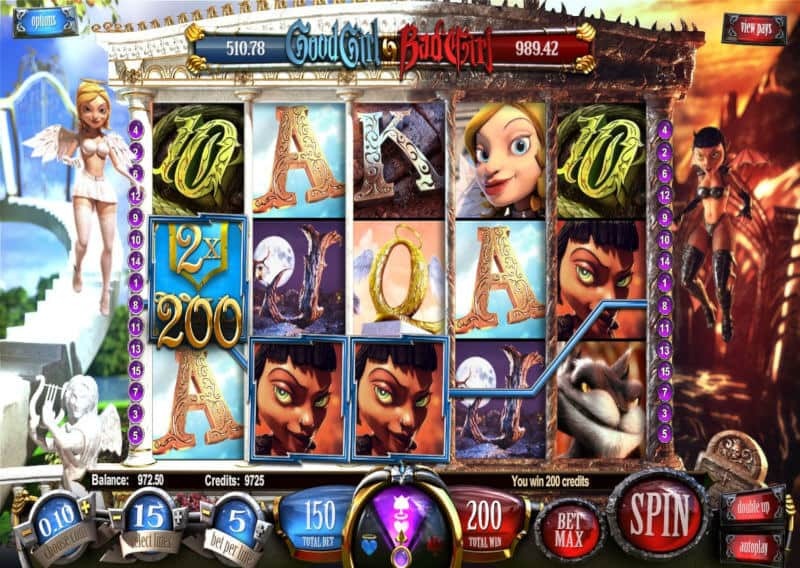 3D Slots: Dr. Jekyll & Mr. Hyde, Good Girl Bad Girl, Mr. Vegas, A Night in Paris, 2 Million B.C. and many more. After browsing the slots category, it is clear that 3D slots are the majority here. This is definitely good news given the fact that Betsoft is the leading provider of such gaming options. These machines have very detailed themes where the animated characters are shown off in a 3D representation. The features also make things exciting with bonus rounds, wilds, and more. For players who like to mix things up and try something different than spinning reels, Wild Online Casino has tabs for blackjack, table games, and video poker. The popular card game of 21 gets its own category due to its wide appeal and also due to the multiple versions provided. There are seven versions of twenty-one, including Single Deck Blackjack and Pontoon. For something a bit more special, you can try Pirate 21 on the site today. Other table games include American roulette, European roulette, craps, red dog, baccarat, three card rummy, and quite a few versions of poker. From Oasis poker to pai gow power, you will be able to play your favorites here for free or real money. There is even a special 3D version called Poker 3 Heads Up Hold'em developed by Betsoft that offers a realistic view while at the table. For even more options, the same category has a Virtual Racebook for horse racing with 3D animations and a pretty fun scratchcard game. Video poker is covered very well. More than 25 online machines make sure that fans of the popular casino game get the versions they love. Nucleus Gaming offers an interface similar to the machines found in land-based casinos while covering the popular variants, like Jacks or Better, Bonus Deuces, 10's or Better, Deuces Wild, and Aces & Faces. For the best experience with table games online, Wild Casino has a complete live dealer section. It features tables for blackjack, roulette, baccarat and super6. These games are played with the help of real croupiers and you can follow the action live by video stream. The complete online review for Wild Casino has to cover every important section and banking is definitely on the list. Our team of experts has checked out the available deposit options and put them to the test to see how efficient they actually are. The verdict is Wild Casino has a good selection of payment methods for a real money gaming site targeted towards customers within the US. There are some limitations that come with banking for online gambling in the country but these can be overcome. Players are definitely encouraged to use cryptocurrency wallets to manage their accounts, especially residents of the United States. However, credit and debit cards can be viable options as well for making deposits. Withdrawals via bank transfers are a bit slow but they always go through if the provided information is correct. Most importantly, financial transactions are 100% secure and that plays a big role in the overall rating of 7/10 that it gets for banking in the Wild Casino review. Almost every online casino nowadays offers a welcome bonus as a way to push new customers through the doors. Some bonuses can be bigger than others but what really make offers different are the wagering requirements and the other terms that come with the bonus funds. Wild Casino uses a familiar strategy of promising big bonuses, with the headline of $5,000 for free being available on the main page. However, the package is not entirely viable for all players since it requires large deposits of $1,000 to actually get the full bonuses. Then there are the high wagering requirements that will block the money until you bet a lot on the eligible games. This isn&apos;t to say that casino bonuses are not rewarding for online players. However, it is good to play within certain limits. Wild Casino will basically allow you to double your first deposits as long as you use the provided bonus codes and you play the right games. The $5,000 package is made out of three bonuses for slots, one for table games, and another for video poker. The playthrough requirement has to be met within 30 days on the corresponding games for each bonus. The first three deposit bonuses are for slots games, but you can opt to skip them if you prefer getting the offers for table games or video poker. Wild Online Casino gets a score of 8/10 for its bonus package in the review because of the high rates for rolling over the amounts. While the bonuses are definitely attractive, most players will not be able to claim the entire sum. Casual bettors tend to make deposits of around $100, which means a bonus of $100 for a total of $200 to play on slots. In order to clear this amount and be able to withdraw it from the account, you must bet $6,000. On the other hand, you can opt to ignore the bonuses and just play with your real money funds. You will have complete freedom over the balance and you can cash out at any time. Every month, you can claim a reload bonus for the games you like. Similar to the welcome package, the operator provides three bonus codes for slots, table games, and video poker. Use the code you want, add at least $50 to the account, and you will get a 100% match instantly. The Wild Casino promo codes for the reload bonuses are available on the site. Players who are not afraid to bet big during the week can get rewards to better enjoy the weekend. The Slots Stampede promotion requires you to bet at least $500 on slots from Monday to Wednesday. If you meet this criterion, you will automatically receive 10 free spins on Friday. The best part is that the winnings from the free rounds are awarded in cash and so they don&apos;t have roll over requirements. Players who bet on American roulette on Saturday can win prizes of up to $500. The top three finalists are determined based on winnings and will be awarded $500, $300 and $200 in free chips that can be used to play live casino games on the following Wednesday and Thursday. Play live casino games for the chance to win a share of $1,800 in the weekly tournament. You will receive one point for every $10 placed in bets when at the live blackjack and live roulette tables. The leaderboard presents the rankings in real time and the top three players for each game will be awarded free chips for the live casino. Visit Wild Casino Get Your $5,000 Bonuses! Games: 130+ Slot and Table Games, Platform powered by Betsoft and Nucleus, 90+ slot games, 8 blackjack versions, 10+ live dealer tables. Join Wild Casino and get started with a free 100% bonus up to $1,000!